One of my favorite homestead assets is our woodstove. There is nothing quite like the heat of a woodstove on a cold winter’s night. Knowing that we can make the house as warm as we want without having to worry about creating some huge electric bill makes the experience seem almost mischievous. I used to be the kind of dad who was constantly reminding the kids to close the front door to the house so as not to “let any of the bought air out!” Now that we heat primarily with our woodstove our kids no longer have to worry when lingering at the front door on a cold morning. To tell the truth, that little bit of fresh, cold air can be quite welcome at times. Knowing that I provided the firewood through my own efforts makes the experience of a woodstove all the more enjoyable. I can look at that fire and know that I cut that wood; I split and stacked that wood, and I… well I get to clean the ash pan later. My point is that the cold winter’s night is a reminder of the hard work we put in during the early spring to have our wood split and seasoning all summer long so that it would burn just like it is now. It is the work of the ant, endeavoring to prepare while others frolic and play, that is now enjoyed with great satisfaction. Our family time is centered around the woodstove in our living room. I find that my wife and I share our best conversation while watching the flickering flames through the glass front door of the woodstove. We can dream up plans for future homestead projects while enjoying the comforts that this homestead project provides. This is more than a subtle reminder of just how much a self-sufficiency project can affect our lives for the better. The installation of the woodstove was quite a project for my wife and I. We (that means she) picked out the porcelain tile that would match the décor of our house. We installed plywood and cement board over the subflooring before tiling. We installed cement board over the existing sheetrock walls and then tiled and grouted. We then had a professional install the stove and stovepipe. While all that might have been summed up in a few sentences, I can tell you that this project took over a week because we were only able to work a few hours per day. This was a lot of work but one that we are happy to enjoy for many years to come. The task of providing firewood is one that I personally enjoy. As we began transforming our property into a homestead, a handful of trees had to be cut down. I take some pride in knowing that those trees were not simply left to rot, but rather, were put to great use in heating our home and providing ash for our gardens. We will be replanting other trees in our effort to be good stewards of this land we call home. We will need to thin out some of the old growth trees to allow for new trees to grow. Much of our land was ravaged by the previous owner who logged many of the trees and left many more to rot. We have been able to save most of these for use as firewood, but some will be cleared to one section of the property where they can compost and provide housing for whatever animal(s) should choose it. Years ago, I owned a house that I heated solely with wood. That property was only one acre with about a half-acre of trees. I culled some of these trees for firewood in an effort to keep the wooded section healthy and appealing. For some time, I would pick up trees others had cut down or trees that were damaged in storms. I did this for about two years until I realized the futility of spending half a day driving all over the area for a couple of trees. Next, I tried doing some cleanup work for tree-cutters in the area. Most people are under the impression that tree-cutting companies will buy the cut wood and haul it off. This is not typically so. These guys have access to more free wood than they can handle so they charge extra to haul it off. They would call me and I would haul it off when they were cutting trees near my house. This was truly a win-win situation. Through some referral, I was able to contact a tree service company that would deliver 5 to 10 cords of firewood to my house. If the trees were whole they would bring them in on logging trucks. If they were cut up, they would deliver them in a large dump truck. For a few hundred dollars I could have enough logs or cut rounds delivered to provide me with firewood for a couple of years. Compare that price to what you may pay to heat your home during the winter using electricity or gas and you immediately see why this price more than acceptable. Just recently I read a couple of ads online from folks who have hardwood “farms” that deliver logs in this manner. Some folks might prefer to have split firewood delivered and/or stacked and that is fine too. Whichever route you go, I would suggest you order your wood in the early spring or late winter (after everyone else has stopped their emergency/storm-type orders for firewood). Planning ahead may get you a better price but more importantly, it allows the firewood to season all summer long. This wood is much easier to light and burns better than wood split later in the year. One option I would consider if you do not have trees for firewood on your property is to look for undeveloped land for sale with plenty of hardwood trees that you might be able to pick up cheap. I would focus on land that is not desirable for development for one reason or another, which would make it more affordable. On the other hand, if you looking for a retirement investment, such a property that might be in the growth pattern for a nearby city might be a decent, long-term investment. You would likely pay more for the property now but remember you are going to provide yourself with firewood from this property for years to come. Once you are ready to fund your retirement or use a larger, lump sum of cash you could sell the land. It might even work best if you clear some of the trees and have them hauled to your property before the sale so that a developer can have easier access to the land and you get the benefit of the firewood for years to come. This type of investment is speculative in nature (meaning you are hoping it will increase in value over time) but since this land will be your firewood farm it is less risky, especially when you take into consideration the future costs of heating your home. I have tried stacking firewood under tarps but really dislike this approach. It never fails that the tarps either get blown partially off during a storm or they fill up with water. The water is ingenious in its ability to run right into my shoe when I attempt to collect the firewood. During the winter, the tarps would collect water and freeze solid making things even less fun. On the last property, I built a lean-to-style shed to hold the firewood. I built it just outside the back door of the house so it could be as close as possible to the woodstove. This shed was 16-feet deep and 20-feet wide, leaving me with room to stack five cords of wood. Living in Virginia at the time, we usually burned four cords, or less, per winter, leaving extra wood in case of an extended winter or as well seasoned firewood for the following winter. Here at our new homestead, we are using a metal carport. At the moment I am using this shed as shade while I split firewood with a maul but, later I will stack the firewood properly. The carport itself is nothing fancy, just the kind you often see for sale on corner lots, gas stations and the like. This carport was delivered and set up in a matter of hours but you may choose to build your own. 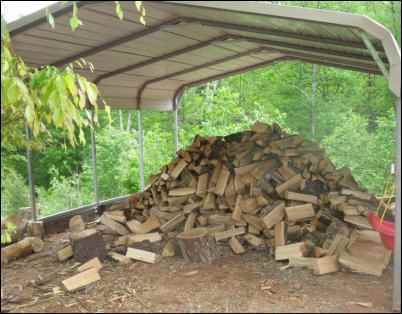 Firewood allowed to properly season in such a shed is easy to light and burns best. You still may want to use some small kindling and/or paper to get a fire going under a couple of logs but well-seasoned wood does not take much work to light. With that said, I will admit it, I cheat. Rather than fussing with kindling a paper I just buy a small Duraflame starter stick or log and break off a small piece about the size of a domino and place it in the center of the stove. I add a few sticks of kindling and place two pieces of oak firewood in a V formation surrounding the starter-stick chunk. I then place a piece of poplar firewood across the V, effectively making an A, so that the starter-stick chunk is directly under the poplar wood. This wood burns quickly and very hot. The starter-stick chunk lights quickly and retains the flame long enough for the kindling and poplar wood to ignite. I let this burn with the air damper wide open. Once the fire is well established I add more oak firewood, cut back the air and flue to get a nice, hot and long burn going. Ok, so I am not a fire-making purist. I know my cheating with the chunk of starter stick seems wrong but sometimes we have to pick our luxuries and this is one my family and I all agree on. One starter stick or starter log lasts quite a long time because we are only using a small piece and only when no coals are present. During most winters you will probably have coals you can use to re-start your fire in the mornings. We store the unused portion of the starter sticks in a resealable freezer bag so as to keep them from drying out. How ever you choose to provide firewood or how you start your fire is up to you but the decision to install a woodstove should be an easy one. Newer stoves are often much more efficient than older stoves so you might consider buying a newer stove rather than using some old woodstove you might find lying around. I also highly recommend a stove with an ash pan. If you go with the older stoves be sure to consider the R-value of the material under the stove. Each stove has its own requirements and even the newer stoves vary quite a bit. Some stoves require quite a bit which would result in several inches of material between the stove and the subflooring. Once your stove is setup and fired-up, you, too, will find just how many people gravitate toward it. This can include small children so be sure to provide some measure of safety to prevent them from getting burned. We chose to order a hearth gate online that we like very much. It looks like wrought iron fencing and has a childproof gate for adults to gain access to the fireplace. This product is easily modified to fit most any hearth design you might need. The woodstove is something we highly recommend for your homestead, but like any homesteading project, you are free to choose the degree to which you jump into it. Whether it supplements or provides all of your heat is your decision. Whether you provide the firewood or buy it already split is up to you. There is no right or wrong, just what works best for you. Whatever degree you choose I think you will find that the addition of a woodstove provides both instant and long-term satisfaction.